The staircase is one of the main focal points in your home. 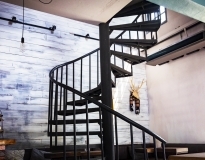 Woodhaven’s Stair & Railing Department is dedicated to providing the absolute best in residential and commercial interior stairs and railings, including custom stair and rail systems. Your home’s stairs and railings provide a necessary function, but they also add beauty and architectural interest to a home’s design. 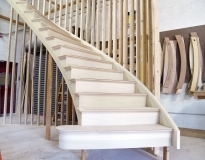 At Woodhaven, we take stairs seriously, and are committed to your project moving quickly and efficiently. To help, we offer: free consultation and estimate development, free on site measuring, custom stair design and material selection, stringer & railing installation and repairs, tread & riser replacement, a one-year warranty from date of installation, and delivery. Show us your ideas, sketches, architectural drawing, or bring in sample replacement pieces to our Stair & Rail Department in Lakewood, NJ, or our other building material stores in Manahawkin and Point Pleasant Beach. Our knowledgeable staff will assist you with all facets of your stair and rail project and arrange an on-site visit to get exact measurements, design input, material selection and discuss budget parameters. Want to talk about Stairs & Railings? "You deserve an acknowledgement for your technical expertise & your customer service. You were consistently responsive, patient, helpful, informative & valuable. "